Программа для диагностики грузовиков ХИНО - рынков США, Японии, России. 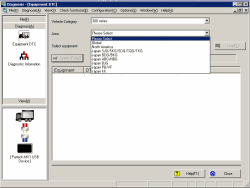 The program runs on a personal computer (PC) equipped with a Windows95, 98, 2000, or XP operating system (OS), and it connects to a communication network by means of a diagnosis connector via a communication I/F. After it is connected to a communication network, it can carry out various operations by extracting information from the engine ECU. This software can be get information of diagnostic from the vehicle's ECU. *”All equipments” is not available in Hino-Bowie. *"All equipments" is available only DST-i. Can be get information of failure Information (DTC) from the vehicle's ECU. Can be get information of ECU data from the vehicle's ECU. Customize the vehicle parameter setting. Save and write to each system. ECU parameters (Quantity survey data) are able to confirm and clear to each system. ECU parameters (Learned value) are able to confirm and clear to each system. ECU parameters (User customizes, Manufacturers parameters) are able to save and write to each system.